My friend Swathi never had a serious boyfriend in college. Well, this can be debated. But I liked to think of myself as the closest she ever came to it, evidenced by our intimate two week road trip cross-country. That said, being the pinnacle of maturity that I am, when it came time a few weeks ago to meet her mysterious (yet real) new boyfriend, Bobby, I took it upon myself to make a meal reminiscent of something we ate together during our trip, on a night that remains, perhaps to this day, one of the most romantic evenings I’ve ever spent with another person. On our great course cross-country, after having successfully battled numerous sets of southerners on the Louisianan pool tables, acquired a $200 speeding ticket in Texas, and eaten our weight in brisket, we decided to forgo a planned course to Swathi’s aunt’s house in Phoenix and instead spent a night at the Grand Canyon which, to her shock, I had never seen. This is how we found ourselves, after a six hour drive from Albuquerque, pulling up to the great expanse just in time for sunset (and also dinner). Together, we took in the view, spoon-fed each other cold leftover carne asada from the night before, and shared a fine white wine, warm and straight from the screw-neck bottle. My version of the asada didn’t quite compare to the authentic New Mexican take-out, but then again, neither did the view of the parked cars outside. Nostalgia (and jealousy) aside, the company still managed to stand up to round one, albeit with slightly less estrogen and no road-side Britney sing-alongs following dinner. p.s. I don’t know how this factors into our love triangle, but just for the record, my trusty CRV which Swathi and I drove cross-country was also named Bobby. Hmm. 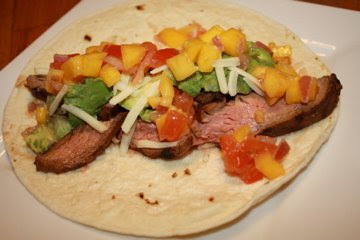 Carne asada is a North Mexican (Baja) dish involving any thin cut of meat (usually flank or skirt steak) that is marinated, grilled, and then served in tacos or burritos. 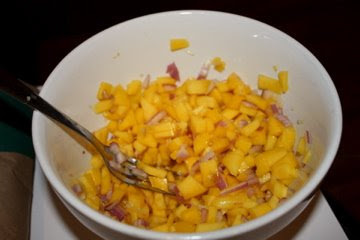 It’s a pretty general term, and so too are the guidelines for the marinade (usually involving chili) and subsequent accouterments (likely including avocado). Ingredient analogies aside, I like to think of it as the Mexican street stand equivalent of a deli turkey sandwich. You can stick with my guidelines below, but the condiments are really up to you. This recipe can easily be made for more people by buying a larger cut of meat and increasing the number of tortillas. The night before: whisk together garlic, lime juice, olive oil, adobo, and salt in a small bowl. Place the steak in a large ziplock bag and cover in marinade, swooshing the liquids around in bag to make sure the meat is fully covered. Marinade overnight. The night you’ll be eating, heat a grill pan over a high flame (alternatively, you can use a large skillet and pan sear). Remove the steak from the marinade and pat dry with a few sheets of paper towel. Lay steak across pan. Grill on one side for 3-5 minutes, until it has nice, black markings. Flip steak and repeat. Rotate the meat 90 degrees and cook for an additional minute or so to gain the cross-hatch grill mark effect. Repeat on the other side. Remove steak to plate, cover with foil, and allow to rest for ten minutes before slicing. Meanwhile, wrap the tortillas in foil and place in a 350°F oven for 5-10 minutes (until warmed through). 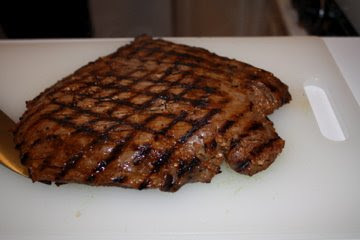 To serve, slice steak in thin strips against the grain*. 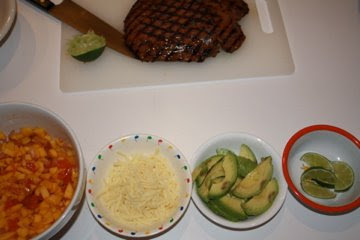 Place limes, cheese, avocado slices, and mango salsa (recipe precedes) in separate serving bowls and arrange buffet style with the tortillas and sliced meat on the carving block. * cuts of meat like flank steak or brisket have a natural way the fibers of the muscle run. (To get a visual, think about how when brisket is cooked down over time it it begins to break apart and become stringy—it is falling apart along the grain.) To create nice slices of meat that hold together well, you need to slice it in the opposite direction of the muscle. It will feel tougher and less natural to make these incisions than if you were going with the muscle, but that’s how you know you are doing it right.